White foxglove-like flowers on a tall spring plant. 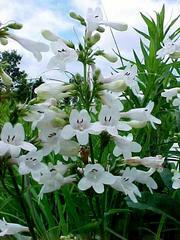 A plant that takes off early in the spring, and rapidly grows to about 4 feet when flowering. White flowers are shaped like foxgloves and are held on a spike at the top of the plant. Easy to grow and disease-free.